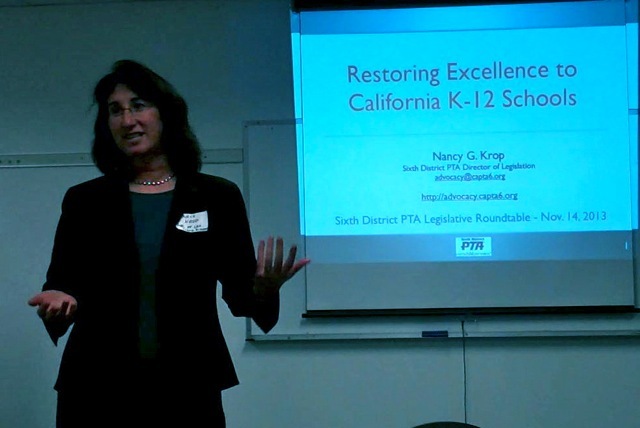 Nancy G. Krop advocates throughout the San Francisco Bay Area and in Sacramento to restore California public schools to the top performing, top funded schools California enjoyed a generation ago. Download the free Click My Cause app now in the Apple Store. Equal Start is Congregation Beth Am's social justice initiative to provide high-quality early learning opportunities for every child. Ms. Krop was recognized with this award based on her eight years of work as lead counsel on an education whistleblower lawsuit that went to the Ninth Circuit Court of Appeal and the U.S. Supreme Court. Ms. Krop worked with the U.S. Department of Education, the U.S. Department of Justice and brought in several law firms, resulting in the second largest settlement for the U.S. Department of Justice obtained without intervention. Learn more here. 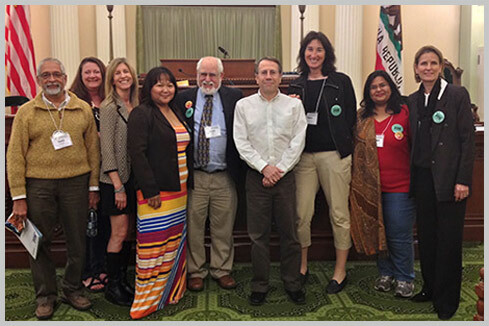 The Palo Alto PTA Council, representing the seventeen K-12 Palo Alto public schools, presented Ms. Krop with a 2014 Honorary Service Award for her tireless education advocacy on behalf of all students in California. In particular, the Council recognized Ms. Krop's advocacy locally on behalf of students at risk of losing their homes to development, as well as her statewide education work to restore stable, longterm, adequate funding for all public school students. Once the model, California schools now rank near bottom in per-student spending (cost of living adjusted) and our underfunded schools perform near bottom in math, reading and science. While top performing states invest $13,000 - $18,000 per student (New York spends $19,000 per student), California spends thousands of dollars less then the $12,000 per-student national average. No great economy ever grew by disinvesting in education. The consequences of such education under-funding are severe. Instead of creating “tax-makers,” California is creating “tax-takers.” Since 1980 California built 20 prisons — half full of high school dropouts — and 1 university. With 59% of California students growing up in poverty, and about 40% English learners, Ms. Krop urges California to re-invest in its most prized possession — its children, its future workers and its future consumers. View “Restoring Excellence to California Schools,” Ms. Krop’s presentation discussing a proven model used in other states and countries to turn around their public education systems from bottom to top performing schools. As Director of Legislation for the Sixth District PTA, Ms. Krop advocated to improve the educational experience of all students. For more information, see the Sixth District PTA Advocacy web page. Ms. Krop's advocacy to preserve a local mobile home park, home to over 100 Palo Alto Unified School District students. Congregation Beth Am member spotlight. Stunned by art, library cuts at son's school, mother is galvanized into action.